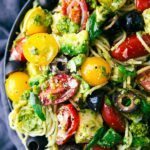 Chilled thin spaghetti noodles tossed with fresh (and easy to make) pesto and veggies. Who is on Snapchat?! I’ve been avoiding it for months (years? how long has it been around?) now and I finally signed up. I’m not sure why I was resisting it for so long because I already completely love it. The best thing about it though? The change-your-face filters. The boys and I have literally played for hours making ourselves look like dogs, cats, unicorns, etc. The toddler was totally freaked out about it at first and kept touching his face to see if he had indeed grown a large dog nose or grew a tongue about a foot long. He also kept touching my face and then looking at it on the screen and then touching my face again. I think he’s finally used to it and he’d do it all day long if I let him. During the late spring and all throughout summer we eat pasta salads all the time. We’ll have them at least once a week if not more. Okay so, actually what really happens is I make about 5x what we would be able to eat in a night because who ever knows how much pasta is the right amount for three people (??) and then we end up having it as a side all week long. This salad has been served alongside dinner for about two weeks and there has been no complaints. I’ve made it a few times now and it has us all ready for some really warm weather. 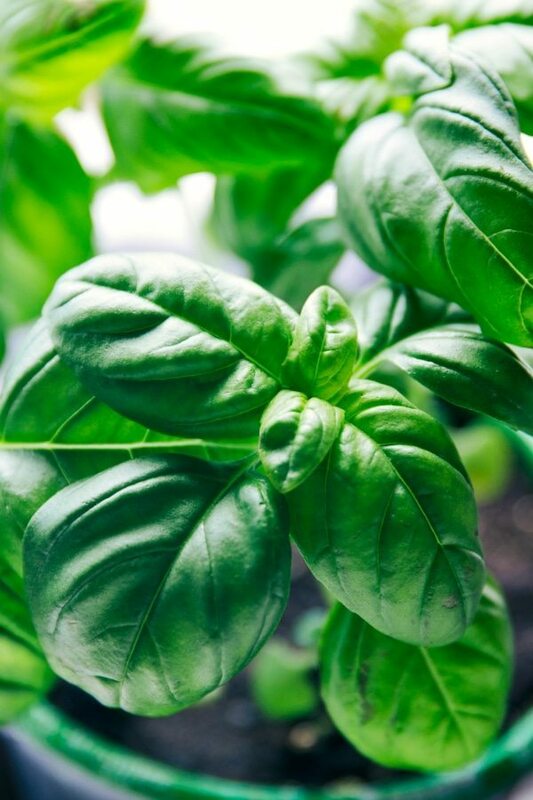 It’s super fast to throw together and a great way to use up tons of basil if you happen to have some growing in your garden (or plan on having it growing soon). Since we all know I have a black thumb (remember when I thought it would be smart to put a new parsley plant in the FRIDGE until I was ready to plant it? ?) I’ll stick to stealing my mom’s basil or getting some at the grocery store. I feel like since my master gardener mother did not pass on any of her knowledge or green-thumb-ness on to me it’s only fair I benefit from her hundreds of herbs all summer long. I’m right here, yes? Yes. 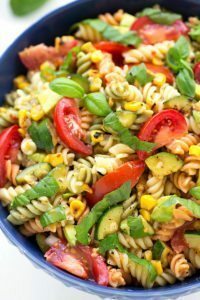 So grab all those delicious veggies, toss them with some fresh-made pesto and chilled pasta noodles, add some cubes of cheese (because why not), and get ready for a crazy delicious pasta salad! P.S. That picture of the basil plant in this post? Yeah, it’s dead now too.? Seriously what am I doing wrong?! Want to save this recipe for later? 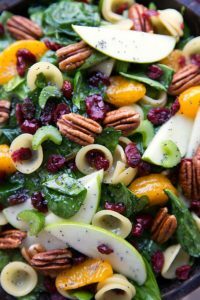 click here to PIN IT to your salad board. Boil the spaghetti until al dente according to package directions. Meanwhile prep the veggies: remove the skin and pit of the avocado and chop into small pieces. Halve the red and yellow cherry tomatoes. Cube the mozzarella into small cubes. Slice the black olives. Drain the spaghetti and rinse in cold water. 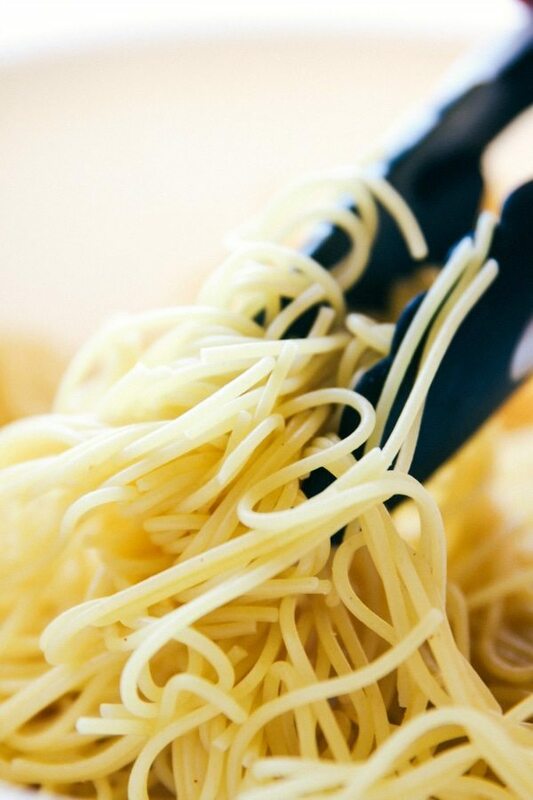 Place the spaghetti in a large bowl and toss with the red wine vinegar and 1 tablespoon olive oil. Add in all the veggies. Meanwhile, prepare the pesto. In a food processor or blender, add 2 cups very tightly packed basil, garlic, and pine nuts or walnuts. Pulse until chopped. Add 2/3 cup olive oil and pulse until JUST smooth. Don't over mix or it can sometimes become bitter. Stir in the Parmesan cheese (don't pulse it in) and taste. Season with salt and pepper and a few squeezes of lemon if desired. 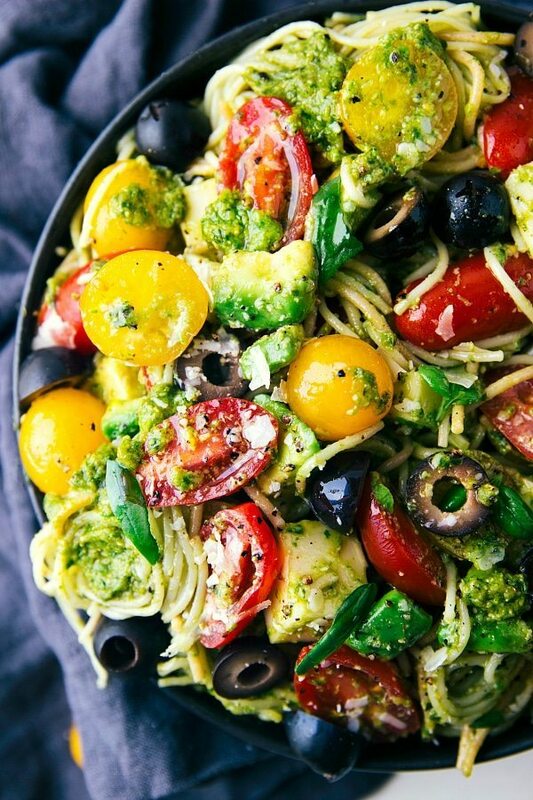 Toss the basil pesto with the spaghetti salad. Add some salt and pepper to taste. Ribbon the remaining 1/2 cup basil and toss with salad. You can definitely leave the salad at this point, but we love to toss the salad with some Zesty Italian dressing (might sound weird but seriously SO good). This is pretty much just to taste or consistency that we like. If you aren't going to add in the dressing you may need a little bit extra olive oil to smooth everything together. Enjoy with a drizzle of fresh lemon if desired. And this pasta! It is totally my kind of dinner! 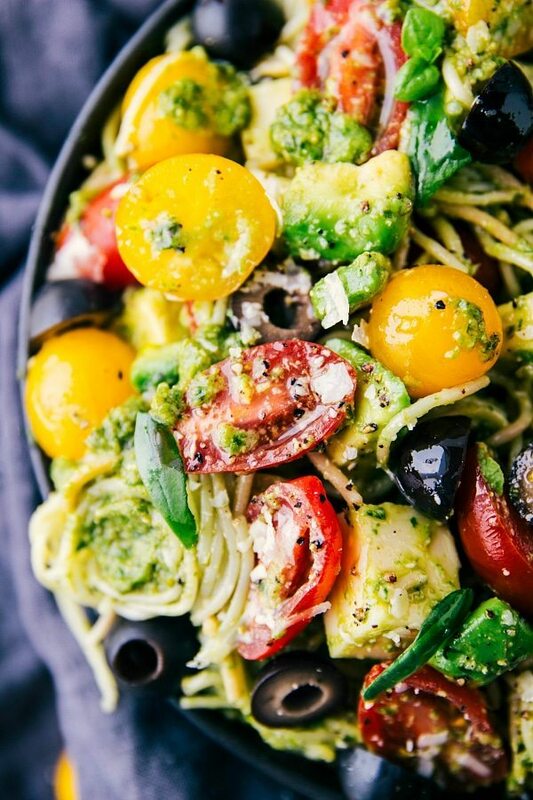 Tomatoes and pesto = perfect!!! Yum! I have been avoiding Snapchat as well. Everyone keeps telling me to add it, but I had a hard time trying to figure out how Instagram works, which might be the most user friendly app EVER. Maybe I will try it sometime.. So you made your own pesto for this dish? Love it! Haha I felt the SAME! I had to have my sisters teach me instagram as well haha! Thank you Cathleen!! that looks so delicious, great pics to. thanks for sharing your recipe. Gaaah this pasta looks so fresh and flavorful! I’m all about a good pesto pasta and now I’m craving this for all the meals. I hear ya on Snapchat..I’ve had it for a while but rarely post…I think I still haven’t wrapped my mind around it, ha! Anyhoo, bravo on the beautiful dish o’ pasta – off to follow you on Snapchat! How much prepared pesto would I use in lieu of making my own? Love these summer fresh flavors! I had to laugh at snapchat – I don’t even do Facebook, prefer to talk to friends. But that’s just me, the kids are all on Facebook and heaven knows what else…. BUT, love your recipes! !